It's Halloween! 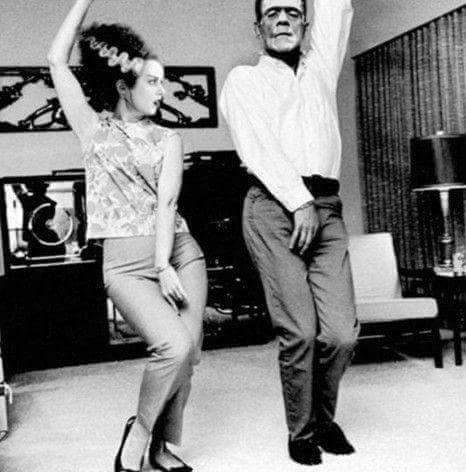 Let's party like monsters!! 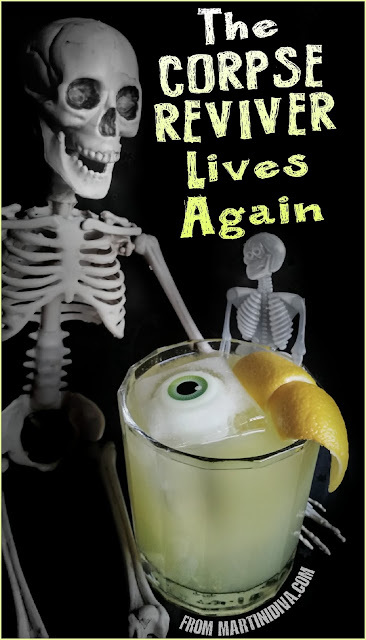 I found two adorable Frankenstein tapas plates and just had to do one more Halloween themed cocktail to use them as props. 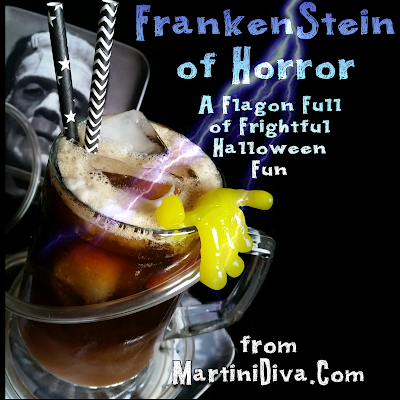 Being the lover of bad puns that I am, I also had to do a drink that played on the "stein" in Frankenstein. That meant some kind of beer and I just recently reviewed Best Damn Cherry Cola Ale and had a bottle left. A little help from some black rum, a bit of chocolate and monstrous mixings were afoot. 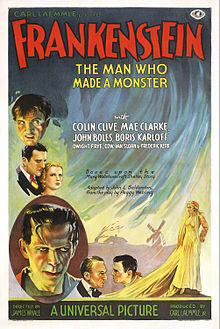 Think Dr. Victor stirring up a reanimated Rum and Coke instead of a man. Sad, cobbled together monster that he is, Frankenstein could probably use a good drink. DIRECTIONS Add the rum and crème de cacao to the cocktail shaker and shake these ingredients until chilled. Pour into an ice filled stein and top off with the cherry cola ale. Garnish with something fun and serve. October 29th is National Cat Day, National Black Cat Day is October 27th and Black Cat Appreciation Day is August 17th so I had to do this cocktail. 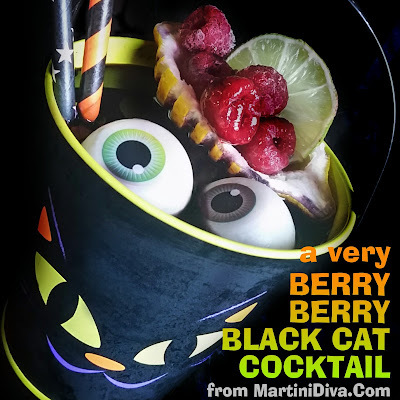 Not that I haven't given a cocktail homage to black cats before with my classic Black Cat Martini, but I found this pretty cool cat-face bucket that was perfect for a decent sized on-the-rocks drink and I just had to use it. I usually hoard my Blavod black vodka for Halloween (and those oddly multiplying requests for a creating signature Goth or Vampire wedding cocktails.) First of all, it wasn't easily available for a few scary years here in the United States. Secondly, it's the only black vodka I will use in my Halloween cocktails because it's black color is created with natural, organic ingredients. 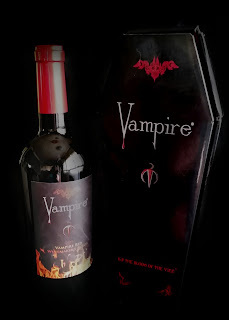 I live in fear of not having it available at Halloween so when I restock I don't buy a bottle of Blavod, I buy a case. Blavod Vodka is black because of the infusion of Black Catechu, which, supposedly, adds little flavor to the vodka. However, along with some mild berry notes and slight hint of anise (licorice) there is a tiny bite of something akin to allspice or maybe clove at the end which I would attribute to the Catechu. However, when mixed with other ingredients these mild flavors will disappear. All in all, it's a very decent vodka with only a slight burn going down and very worthy of the higher end price, if only for the deep black and completely natural black color. 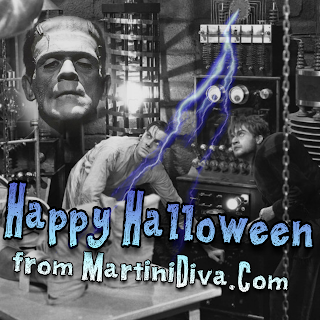 It's a Halloween freak's best bar buddy. Garnish: Frozen raspberries and a lime wheel in a hollowed out lemon. If you can get blackcurrants, add a few to the lemon boat as well. I added a few, fun eye ball ice cubes as well. DIRECTIONS Add the ingredients to a cocktail shaker filled with ice and shake until well chilled. Strain into a rocks glass filled with ice, garnish and serve. Allow guest to choose whether or when to add in the garnish. TIP: Keep both the Chambord and Crème de Cassis refrigerated for longer shelf life. 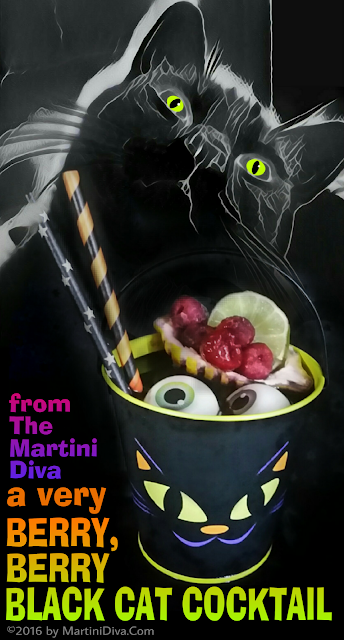 Halloween (Oct. 31st) and Day of the Dead (Nov. 1 - 3) come very close together, which is fortunate for me because I like to celebrate each with special, bespoke cocktails. 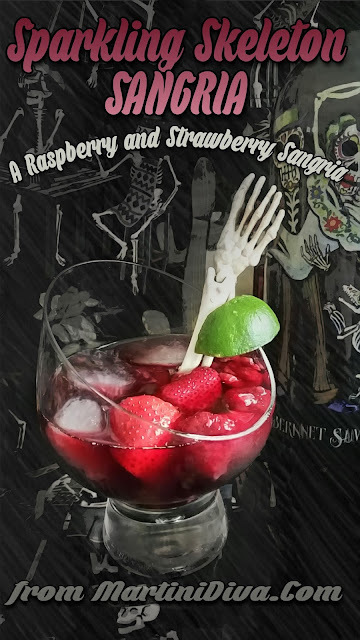 This time I got to combine the two in one cocktail because I found a fun Day of the Dead Cabernet Sauvingon to play with at World Market aka Cost Plus. 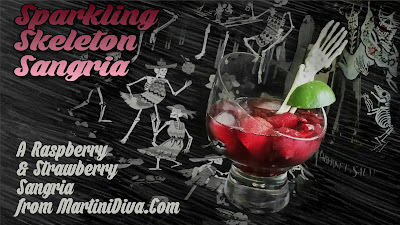 I knew the minute I saw that skeleton bedecked wine that I was going to do a sparkling skeleton themed sangria recipe. I had also found some "limited edition" raspberries and late harvest strawberries just begging to go swimming in some fruity Cabernet. DIRECTIONS Warm half a cup of the wine with the Raspberry Honey Crème in the microwave for 20 - 30 seconds to make a quick simple syrup that will mix into the sangria easily. Combine all the ingredients together, except the Prosecco and ice, in a mixing pitcher. Cover and let sit for a minimum of 2 hours. (Overnight is fine too, but the delicate berries will break down more which also means you get more berry flavor.) Just before serving transfer the Sangria to a serving carafe filled with ice, leaving enough room to add the chilled Prosecco. After adding the Prosecco, pour into individual glasses, garnish and serve. SERVING TIP: Frozen berries make ideal ice cubes. You can also freeze berries in the ice cubes. 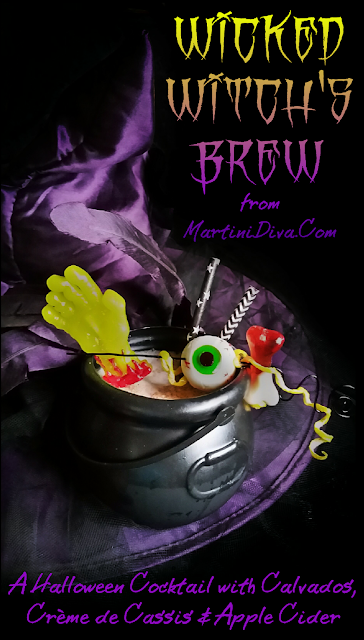 You can't do Halloween cocktails without at least one nod to a witch's brew, right? 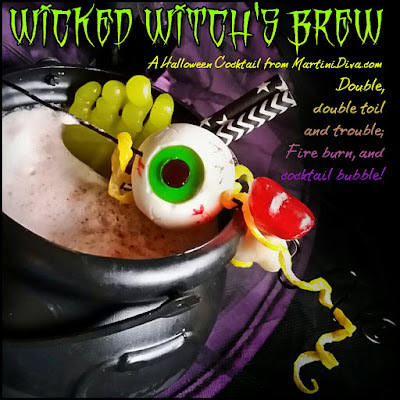 Since I found a perfect drink sized witch's cauldron this year, I figured it was time to do my own version of a bubbling cauldron of witchy wassail. 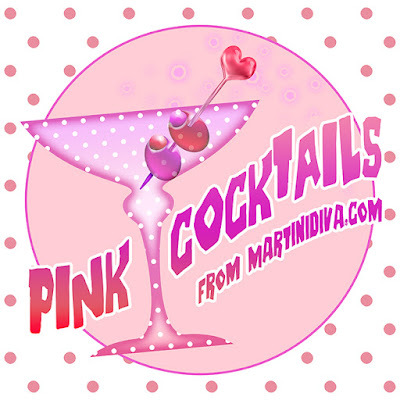 My cocktail recipe is an adaptation of Charles Schumann's Apple Sunrise created at Schumann’s Bar in Munich in 1980. 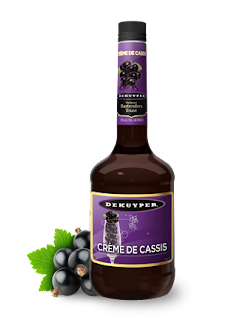 I thought it would make a great witch's wassail type brew, plus I had the Calvados and the crème de cassis at hand. DIRECTIONS Shake ingredients without ice for a minimum of a minute to emulsify the egg white and build the foam. (Alternatively, you may use a blender for this step.) Shake cocktail with ice to chill then strain into the ice filled cauldron or an ice filled rocks glass. Tap the bitters onto the foam, add several of the body part gummies, a lemon twist, straws and serve. If you really want to make this brew bubble, add a large chunk of dry ice to your glass before adding the regular ice. The regular ice will keep the dry ice from accidentally being sipped in. Handle the dry ice with tongs or gloves to prevent burns. Since the beginning of time, man has had a fear of strong, powerful women. So much so that a name was invented to classify, imprison, torture and kill them. The term "witch" stems from the old English term "wicce", a word applied to those who practiced "magic" the occult and even those who practiced healing arts. In other words, abilities and practices people didn't understand were termed witchcraft and dealt with according to current religious beliefs. Though males were sometimes a target of this type of discrimination, most often the victims were female. In male-dominated societies, unusual power and abilities in women were seen as dangerous and evil and quickly dealt with so as not to upset the status quo. 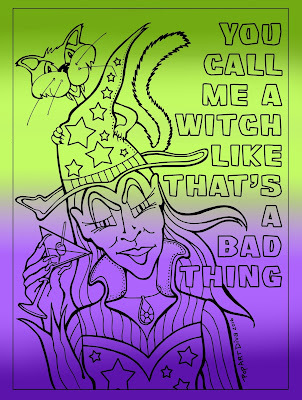 Though we no longer persecute witches, at least in a legal or societal area, the term is still applied to women as a negative and pejorative description. 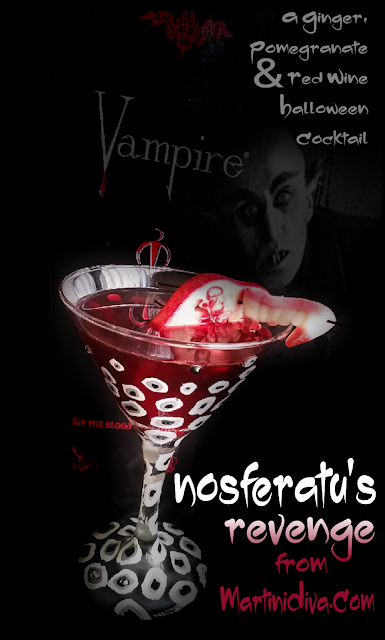 I've done a few Vampire cocktails for Halloween, a garlic infused Vampire's Kiss, a cherry and pomegranate True Blood Martini, a Bloody Mary style Dracula's Bloody Martini, and even a spiced grape and black vodka Transylvanian Cocktail; however I've not done a cocktail nod to one of the most ancient vampiric legends, Nosferatu. 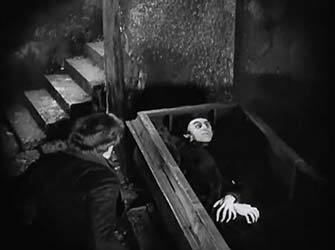 This vampire became famous as Count Orlok in a 1922 film of the same name, but the legend goes back to the mists of time and Romanian folklore. The name itself comes from the Romanian Nesuferitu ("the insufferable/repugnant one") or Necuratu ("unclean spirit") and came into use sometime in the mid to late 1800's. 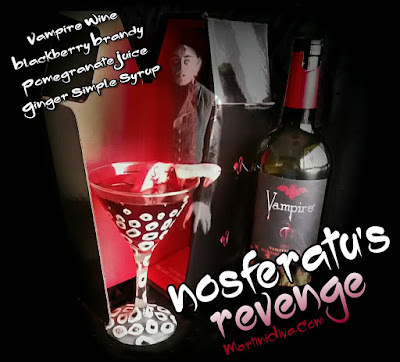 Since I stumbled on a very cool bottle of Vampire Red wine, in an even cooler coffin box package, I thought I'd make the poor blood sucking guy a drink to suit his mood. Poor guy. Called unclean, reviled as repugnant, feared for his nasty nocturnal habits. He is probably incredibly thirsty by now and mad as heck. DIRECTIONS Add the red wine, pomegranate juice, ginger simple syrup and blackberry brandy to a cocktail shaker filled with ice. Shake until chilled, strain into the chilled glass, garnish and serve. PLEASE DRINK RESPONSIBLY .... and be very careful who you invite into your home. Everyone has a few skeletons in the closet. Mine are just drunk. They're quite annoying little guys who keep me awake at night with their rattling and rowdy antics. 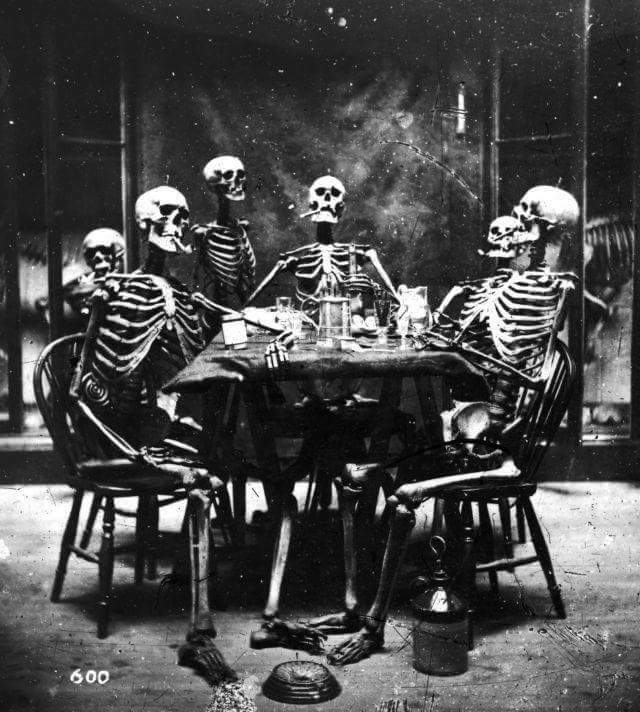 They make great party guests on Halloween and Day of the Dead though. DIRECTIONS Take a tablespoon of Honey Ridge Farms Honey Créme Lemon and thin to a syrup consistency with a tablespoon of hot water. Dry shake (without ice) all ingredients except the red wine to emulsify the egg and create a foam. Shake again with ice to chill and dilute then strain into a chilled glass. Float the red wine over a spoon on top, garnish and serve. PEAR INFUSED BOURBON (Feel free to use regular bourbon if you don't have the time to make the pear infused version, but if you do it really finishes the pear flavor of the cocktail.) Wash, dry, core and slice 4 red Anjou pears into eight slices each, add them to a large Mason jar. Pour in a fifth of bourbon and let infuse for a week minimum, shake and taste every day. Strain into a clean bottle or Mason jar. If you allow this to infuse for a week or two longer it mellows out nicely. DRIED PEAR SLICES (Also works for oranges, lemons, limes and apples.) Cut your fruit into slices approximately 1/4" thick. Place the slices onto a parchment paper lined baking sheet. Dry in the oven at 200 Fahrenheit for 2-3 hours, each fruit will dry at different cooking times so check every hour. When the fruit has dried to a leather consistency, turn off heat and leave in the oven to cool. Store in plastic bags or covered container. 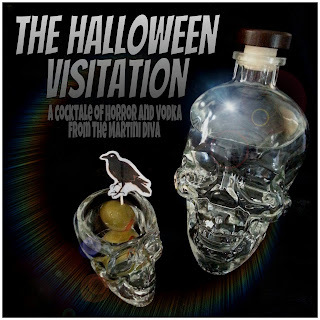 A couple of Halloweens ago I wrote a little horror poem, "THE HALLOWEEN VISITATION, A Cocktale of Horror and Vodka", about ravens knock, knock, knocking at my door begging for my Crystal Head Vodka. 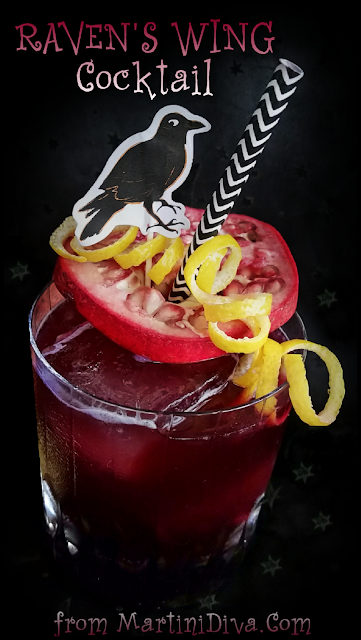 For some reason I didn't create a cocktail to accompany that Edgar Allan Poe parody. Time to correct that right now. 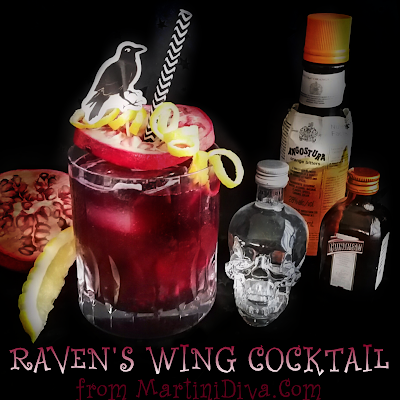 I wanted a dark cocktail with a purple cast to it, like raven feathers, and something fruity but tart. Something ravens, and people, might like their Crystal Head Vodka with. Maybe if I named a cocktail after them those darned birds would leave my nightmares alone. DIRECTIONS Chill glass in freezer. Add all the ingredients, EXCEPT the B'Lure and the large ice cube(s), into an ice filled cocktail shaker and shake until chilled. Add the large ice cubes to the chilled glass, pour the cocktail over the ice. Add the B'Lure over the back of a spoon down the inside of the glass, do NOT stir but allow it to settle at the bottom. Garnish and serve. Crystal Head Vodka. Just perfect for Halloween. Perfect anytime, but Halloween is seriously skull bottle and vodka friendly. 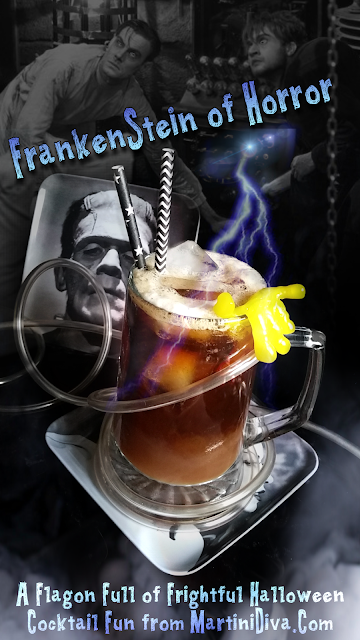 I get into the skeletal spirit again this year, but while everyone else is zigging with the typical bloody tomato juice vodka drink, I decided to zag that seven times distilled Crystal Head Vodka into a coffee and chocolate wine frozen libation. 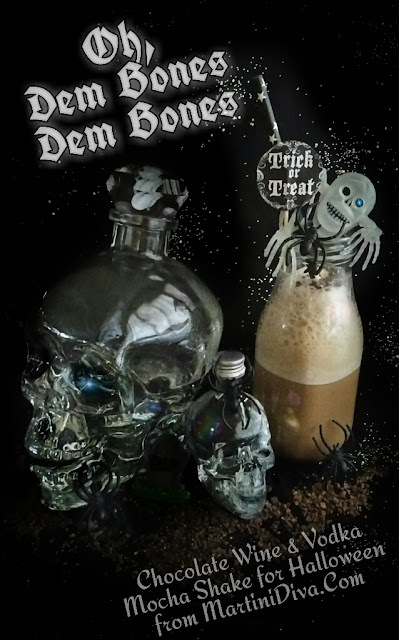 The beautiful skull bottle and that Herkimer diamond filtered vodka deserve a little zing, plus those poor bones in the graveyard need a little wake-me-up to get rattling along. DIRECTIONS Blend all the ingredients until smooth. Pulse to make sure all ice cubes have been crushed. Pour into the chilled milk bottle, garnish and serve. * TURBINADO RICH SIMPLE SYRUP (Rich simple syrup is 2 parts sugar to 1 part water as opposed to basic simple syrup which is a 1:1 ratio.) Heat 2 parts Turbinado Sugar and 1 part water on medium just until the sugar has dissolved. Cool and refrigerate for up to 3 months. 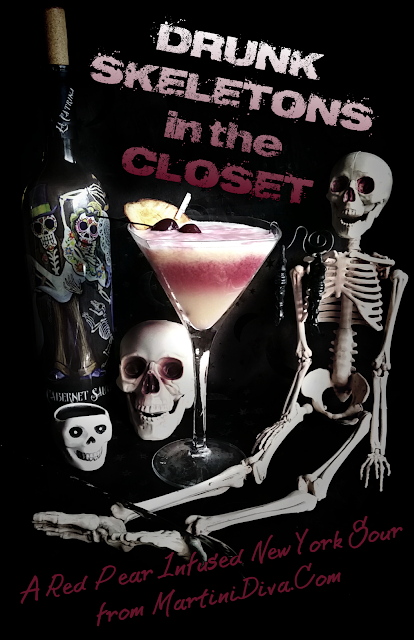 Add a tablespoon of Crystal Head and that simple syrup can last up to 6 months or longer! 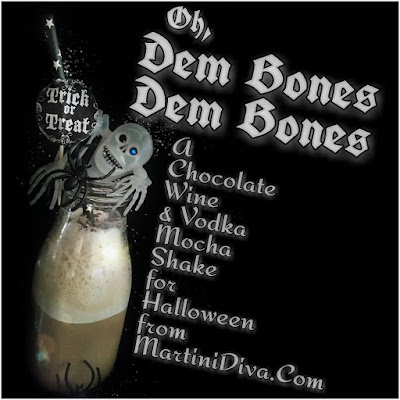 An added benefit of doing this cocktail was I finally found a way to incorporate Chocovine in a mixed drink AND got to name a Halloween cocktail after the great gospel song "Dem Bones, Dem Bones, Dem Dry Bones" made popular by The Delta Rhythm Boys. 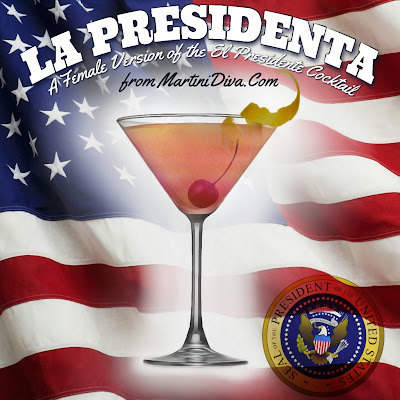 The El Presidente was created during the American Prohibition at the Jockey Club in Havana, Cuba by American bartender Eddie Woelke who named it after then Cuban President Gerardo Machado. There's a great article on it by Wayne Curtis with more details here. DIRECTIONS Stir ingredients with ice in the mixing glass until chilled, strain into your chilled cocktail glass, garnish and serve. You might just want to make a big batch for this particular upcoming election. 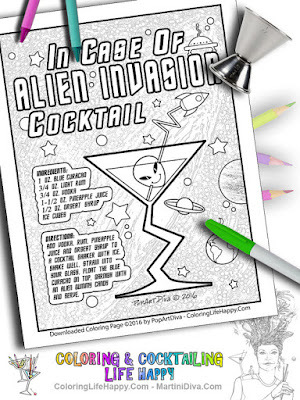 I don't know what it is about Halloween and aliens with me, but I truly believe if they ever do invade it with be on October 31st. That's if they have done any research at all. Everybody knows you can be an alien on earth on Halloween and nobody will notice you because everyone is in costume. (The possible exception would be those annoyingly aggressive Martians from Orson Wells' War of the Worlds.) Slick marauding ETs could probably even take over the White House before all the Trick and Treaters are back in bed with candy belly aches. Plus, electric blue cocktails either say Halloween or Tiki to me. This one has touches of both. Because I'm just that twisted. 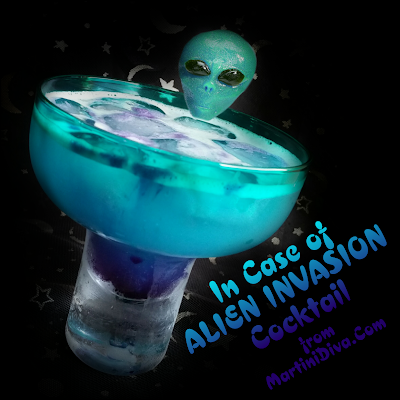 As for those invading guys, all I can say is they better keep their claws and/or tentacles off my Crystal Head Vodka or I'm going all Independence Day on them. DIRECTIONS Chill the glass in the freezer. Fill your cocktail shaker with ice then add the other ingredients. Shake until chilled then strain into an ice filled, chilled glass. Add the alien gummy to the rim then add drops of the B'Lure down the inside of the glass and onto the ice cubes then serve. 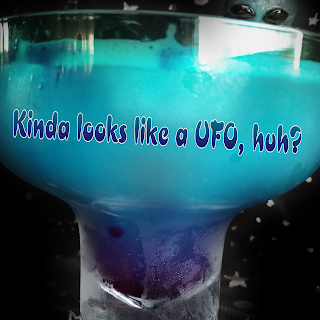 If you really want to add some serious extraterrestrial then shave a few chips of dry ice on top just before serving. Just make sure the dry ice has dissolved before drinking. 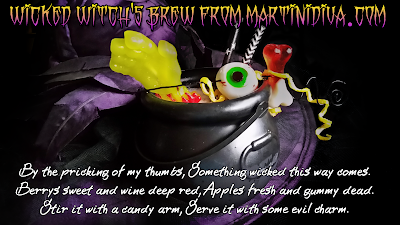 This cocktail is featured in my COLOR YOUR COCKTAILS Recipe and Coloring Book but here I changed it up a bit for Halloween and added the B'Lure for a bit of extra color fun then added some lime bitters to balance the extra sweetness from the B'lure's pea flower extract. 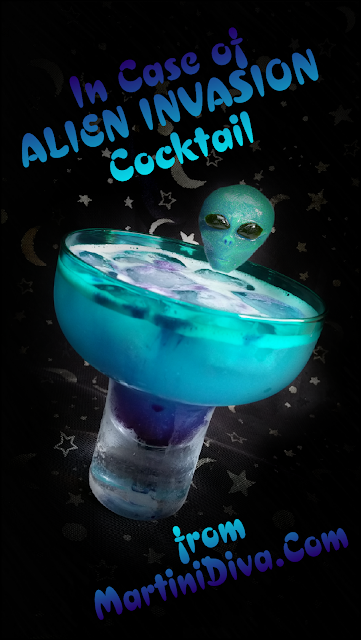 National Alien Abduction Day is March 20th, National Alien Day (Alien426 Day) is April 26th, World UFO Day is July2nd. 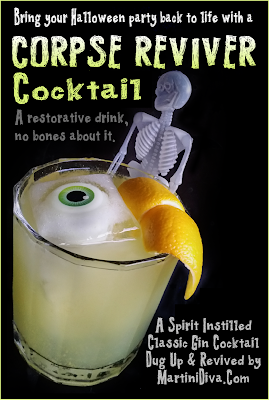 The CORPSE REVIVER COCKTAIL and Recipes A little history, some thoughts and quite a few recipes. 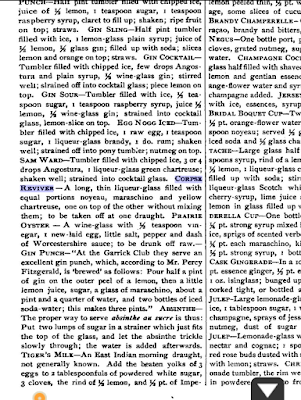 The Corpse Reviver "before 11am, or whenever steam and energy are needed." ~ Henry Craddock Most references to the Corpse Reviver state that the earliest recipe in print appears in Harry Craddock's 1930 version of "The Savoy Cocktail Book", but recipes for the Corpse Reviver actually appear much earlier in literature, in fact, as early as an issue of Punch in 1861. 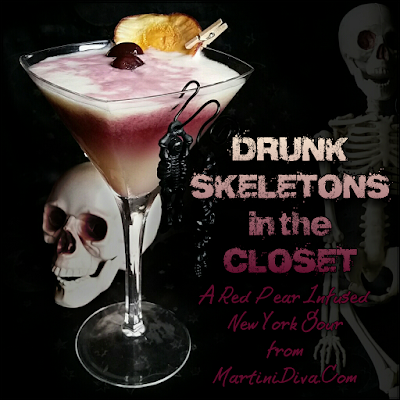 Another early recipe for the corpse reviver that pre-dates Craddock's can be found in 1903 in The Steward's Handbook and Guide to Party Catering. 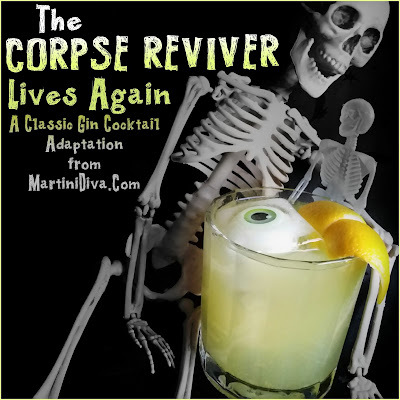 There are several recipes for the Corpse Reviver, the primary ones being the Corpse Reviver 1 and the Corpse Reviver 2. The CORPSE REVIVER LIVES AGAIN INGREDIENTS 1-1/2 Oz. Hendricks Gin 1/2 Oz. Fresh Lemon Juice 1/4 Oz. Fresh Lime Juice 1/4 Oz. Fresh Orange Juice 1 Oz. Cointreau 3/4 Oz. Cocchi Americano 1/8 Tsp. of Pastis 1 Tsp. Simple Syrup Ice Garnish: Large Lemon Twist, Skeleton, Large Ice Cubes with Gummy Eyeballs Tools: Cocktail Shaker, Metal Strainer Glass: Rocks DIRECTIONS Shake ingredients together in a mixer with ice. Strain into ice filled chilled glass. Garnish and serve. You'll note I added lime and orange juice to the lemon juice. I wanted some slight greenish color from the lime and added the orange to pump up the Cointreau. I went with Cocchi Americano because the Lillit called for in the original recipes was Kina Lillit, which no longer exists. The present-day version, Lillit Blanc, is minus the quinine that distinguished the original aperitif. As for the Pastis, I substituted this liqueur for the Absinthe because it's much milder, less licorice aggressive and has sugar which brings a touch more sweetness to the cocktail. I felt it would fight less with the distinctive rose and cucumber notes of my gin choice which has a very subtle licorice back note of its own. I love blackberries and before the season was over I wanted to get one last fresh blackberry cocktail under my belt. As we are still dealing with summer temperatures here in Arizona despite it being fall, I also wanted something tall and cool. When I'm not constructing a new craft cocktail for my brand or for an event I often revert to simple classic cocktails for my personal drinks. One of my favorites in summer is a tonic, usually gin tonics, occasionally vodka; the choice of spirit is usually based on what I'm adding to the drink. I rarely do a straight gin and tonic, I like adding fruits and using the herbs from my little garden on the back deck. This way I get a little variety at happy hour without a lot of thinking or work. I'll be honest here, if I'm not making any money on it I'm not going to spend hours creating a new cocktail just for myself. That's not to say I don't make myself good cocktails, I do and this is a very good cocktail, just not complex. And sometimes that's just what you're looking for at happy hour. The only thing I tweaked a bit was using Crème de Cassis in place of the simple syrup. DIRECTIONS Muddle the blackberries and lime juice in the bottom of a cocktail shaker. Fill with ice, add the gin and Crème de Cassis then shake until chilled. 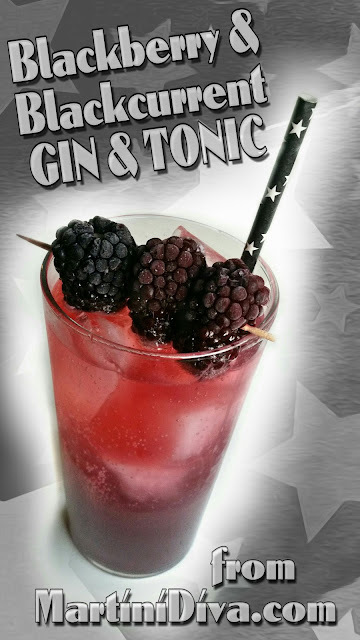 Strain into the ice filled Collins glass, top off with tonic, garnish and serve. 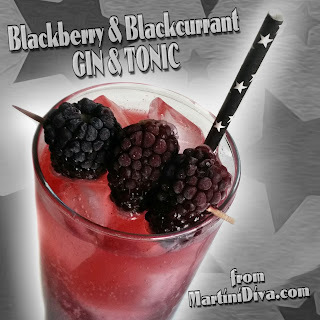 International Gin and Tonic Day is Oct 19th, National Gin and Tonic Day is April 9th and National Blackberry Day is September 12th. 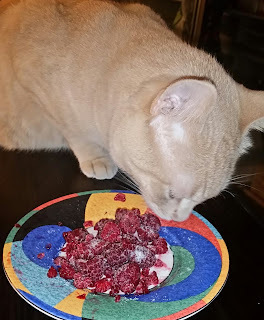 Here's the thing about me and rhubarb. It's a fruit that grows in spring but I always crave rhubarb cocktails in fall. I have no idea why and it's annoying because I can't get fresh rhubarb in the fall. But I'm aware of my odd craving so I always freeze some just for this reason. (I also freeze a few full stalks as garnish; by putting a bamboo skewer in them I can keep the frozen stalk from drooping as it defrosts in the cocktail and that chilled stalk helps keep my cocktail chilled!) 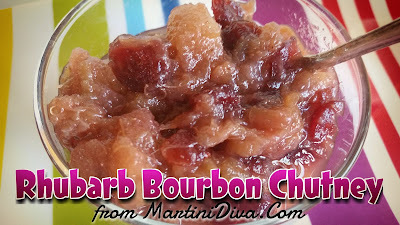 I really have no other use for rhubarb except for Rhubarb Chutney, that recipe is included here as well. Come to think of it, I see chutney as kind of a fall condiment, maybe that's why I associate rhubarb with fall. 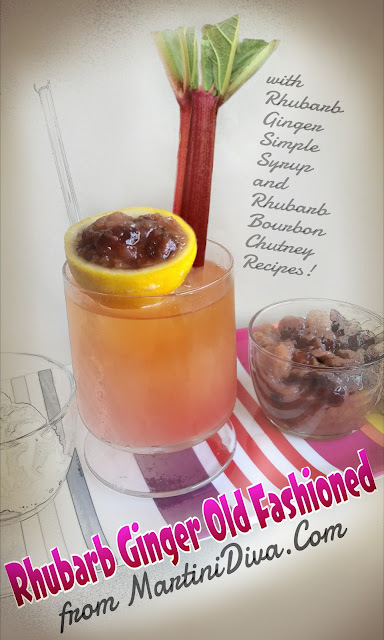 Nevertheless, when summer temperatures drop here in Tucson, I'm ready for rhubarb cocktails and a favorite is a Rhubarb Old Fashioned. DIRECTIONS Chill the glass in the freezer while you get your ingredients in place. Add the lemon juice and Rhubarb Ginger Simple Syrup to the chilled glass and swirl it around. Add ice cube(s) then pour in the Templeton Rye and the Rhubarb Bitters and stir until chilled. Garnish and serve. Directions Bring the ingredients to a boil and stir until the sugar dissolves. Mash the rhubarb up with a potato masher to release more of the juice. Reduce heat to medium low and simmer for 3 minutes. Set aside to cool. Strain out the solids BUT set them aside to add to your Rhubarb Chutney below! Stores bottled in the refrigerator for up to 2 weeks, longer if you add a tablespoon of vodka. Directions In a large saucepan, bring everything but the rhubarb, onions and cranberries to a boil. Reduce the heat to medium until the sugar dissolves. Add the rhubarb, onion and cranberries and simmer on med-low until the mixture thickens enough to spoon onto toast, meat, or whatever you're serving it with. With the added bourbon this took about 15 minutes, just keep an eye on it. Allow to cool (or serve warmed if you prefer) and serve with cream cheese and garlic toast. Also great on pork ribs and chops and grilled chicken! TIP: Be sure to blanch your rhubarb before freezing to keep the beautiful colors bright. 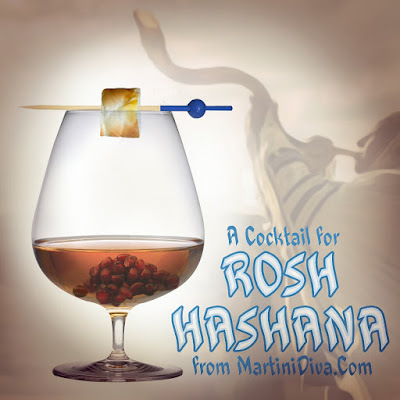 Rosh Hashana is believed to be the anniversary of the creation of Adam and Eve. The feast traditions of Rosh Hashanah include the eating of Challah bread dipped in honey, apples dipped in honey, and pomegranates. 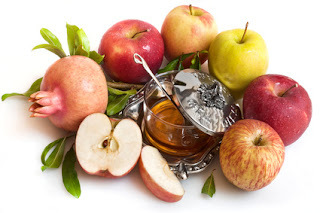 The Challah and apples with honey are eaten to symbolize the hope for sweetness in the year ahead. Pomegranates symbolize the hope for good deeds and plenty because of their numerous seeds. To create this experience in a cocktail I have created a duo cocktail that consists simply of Calvados*, a superb French apple brandy mixed with honey. I used Honey Ridge Lavender Honey Creme to add a light floral note, then garnished with pomegranate seeds and a cube of Challah bread to dip in the drink. "Ba-ruch a-tah Ado-nai E-lo-hei-nu me-lech ha-olam bo-re pri ha-etz. Blessed are You, L-rd our G‑d, King of the universe, who creates the fruit of the tree." DIRECTIONS Warm the lavender honey with an equal amount of HOT tap water to create a quick simple syrup in the bottom of the brandy snifter. Swirl this around to warm the bowl. Add the Calvados (at room temperature, 65°F / 18°C), garnish and serve. While drinking cup the snifter with the palm of your hand to keep the drink warmed. * Per the Consistoire de Paris, certain brands of Calvados are Kosher, these include Boulard and Père Magloire. 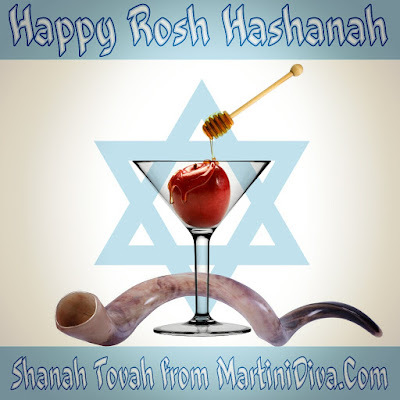 L' shanah Tovah, wishing you good health, happiness, peace and prosperity in the new year.